the CI journal: Taiwan CI's turn 10!!!!!!!!!! Ten years... 500+ teachers... 4500+ children... Ten years of experiences, lessons, and friends who have changed our lives forever. 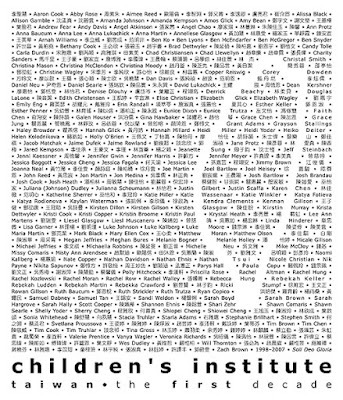 This graphic is a sneak preview of the Taiwan CI 10th anniversary T-shirt design. Email Karen if you're interested in ordering a shirt (don't forget to specify your size). This offer is only available while supplies last. If you're coming with this year's team, you're in luck-- you'll get yours for free. To kick off the anniversary celebration... a little trivia to help my veterans reminisce. We will give a FREE T-shirt to the first CI junkie who can answer all the questions below correctly. List the five Team Directors. Who was the first Teacher Trainer? Name Taipei's two most notorious Wisdom Walk Frequent Flyers. Which family has sent the most children to teach in Taiwan? Which five countries (excluding Taiwan) have been represented by CI teachers? Which CI song originated in Taiwan? Who told the most "romantic" rendition of the Eagle Story? Who has played the piano for the most number of CI's? What's the age limit for CI assistants? Name four CI veterans who have returned to teach in Asia for a year or more. Looks great Karen! Praise God for what he has done through the CI and Basic ministry in Taiwan and I'm excited to be a part of it this year. I love the design, and I also think this site looks great! Looking forward to what God has in store for this seminar season! The design is really cool! I am going to really miss being in Taiwan with you guys. I am thankful to our God for being able to come and experience working for him in a foreign country last year. I couldn't have gone, or done it without his strength and help. did y'all make it over there safely? when will this be current? In response to Judy's question: Our goal is to update the blog with either pictures or a post everyday. Sometimes both. It should be current from this day forward until the end of the trip.